THOMAS C. HINDMAN. Endorsement Signed. 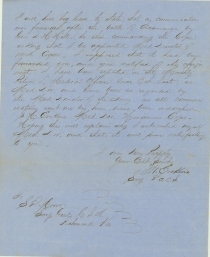 [Dalton, Ga.], February 8, 1864, on John H. Erskine, Autograph Letter Signed, to Confederate Surgeon General S.P. Moore, Dalton, Ga., February 8, 1864. 2 pp., 8 x 10 in. [Endorsement:] Hd Qrs Hindman’s Corps, Febry. 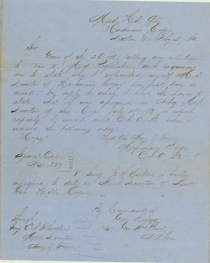 8, 1864. In October last Lt. Genl. Hill wrote a letter asking that Surg. J. H. Erskine might be assigned to duty as Medical Director of this Corps by the proper authority. Soon after Special Order No 257, Par I, from Hd Qrs of the Army, was recived. It was a fair presumption that the War Department had authorized the Commander of this Army to make such assignments; and in my opinion Surg. Erskine was not called upon to look behind this action. As the question has been raised, I now respectfully request that this faithful, energetic and intelligent officer may be regularly appointed Medical Director of this Corps by the War Department. T.C. Hindman. / Maj. Gen Com’g. Major General Hindman reverted to division command just a few weeks after this, with John Bell Hood assuming command of the corps. 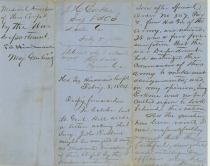 Hood retained Erskine as corps medical director. Thomas Hindman (1828-1868) was born in Tennessee but lived most of his life in Arkansas. He served in the Mexican War as 2nd lieutenant in the 2nd Mississippi Infantry, and was later elected to Congress (served 1858-1860). He was a leading secessionist in Arkansas, and was appointed colonel of the 2nd Arkansas Regt. at war’s outset. He was promoted to brigadier general in September 1861, and to major general in April 1862, and commanded the Trans-Mississippi Department for a time in 1862. In 1863, he joined the Army of Tennessee for the Battle of Chickamauga, fighting under Longstreet, and was incapacitated during the Atlanta Campaign. He fled to Mexico in 1865, returned in 1868. After recommencing his law practice and making some political speeches, he was assassinated by an unknown assailant. Part II, p. 549, Part III, pp. 575-576.